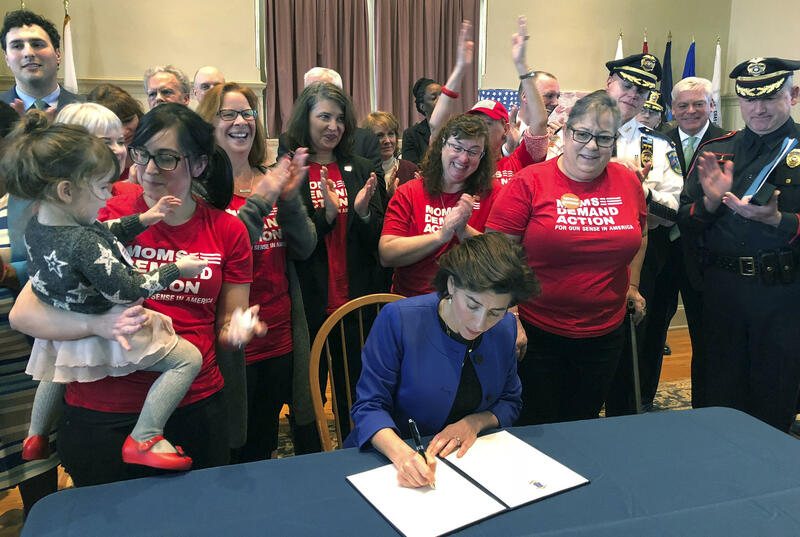 Rhode Island Governor Gina Raimondo signs an executive order Monday, Feb. 26, 2018, in Warwick, R.I., to establish a new policy to try to keep guns away from people who show warning signs of violence, in one example of a "red flag" bill. California, Connecticut, Indiana, Illinois, Oregon and Washington are among the states that have created similar laws. A strategy to reduce gun violence has won the support of most members of the Kalamazoo County Board. On Tuesday, commissioners passed a resolution 9-2 supporting a “red flag” law for Michigan. In states such as Indiana, those laws let a court take firearms away from someone if they are found to pose an immediate threat to themselves or others. The Michigan House is considering red flag legislation - though it’s sat in the Judiciary Committee for more than a year - and a bill in Congress cosponsored by Republican Representative Fred Upton of Saint Joseph encourages states to embrace those laws. Commissioner Tracy Hall, who sponsored the resolution, says she recently lost a friend to suicide. “A gun was used, and I don’t know if a piece of legislation like this could have helped, but I can tell you it’s been running through my head,” she said on Tuesday. Two members of the Board opposed the resolution, including Republican Vice Chair Dale Shugars. “This gives the law enforcement person a little bit more power to do things and I just don’t feel comfortable with that at this time,” he told the Board. In the Midwest, Indiana and Illinois have passed red flag laws.